I have started working for a non-profit start up called Chronicle in St. Louis. 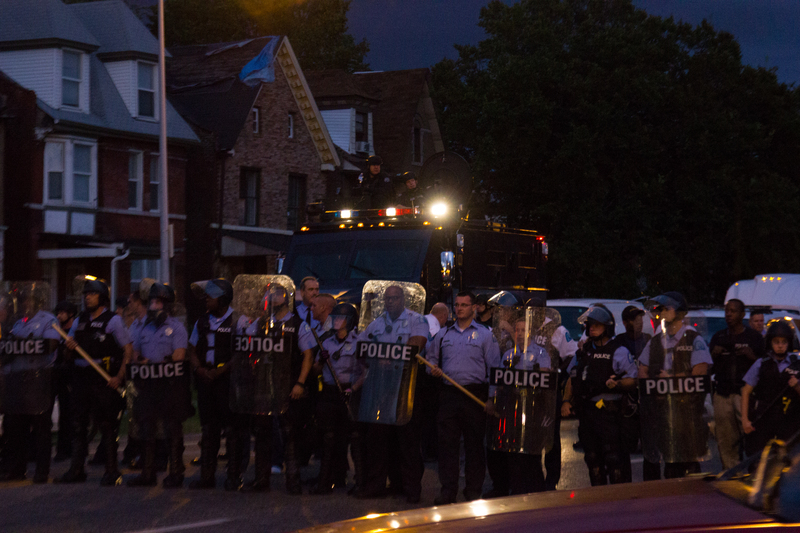 The goal of the project is to crowdsource photos to create a historical book about the events in Ferguson and St. Louis, develop a curriculum to teach from it, and to start documentary photography workshops for kids. The book and curriculum will be given to local schools, libraries, and colleges for free. I can only write so much about this new job, but you can follow what is happening on the official Facebook page and Instagram profile. I’ll start off with how I found out about the project, Chronicle :: Ferguson, and how my first day of “work” went. In March I found out about the project via a message on twitter from a friend who said that someone was looking for images of Ferguson to be in a photo exhibit at the International Photography Hall of Fame. It sounded straight forward enough, but nothing I’m involved with ever goes according to plan. 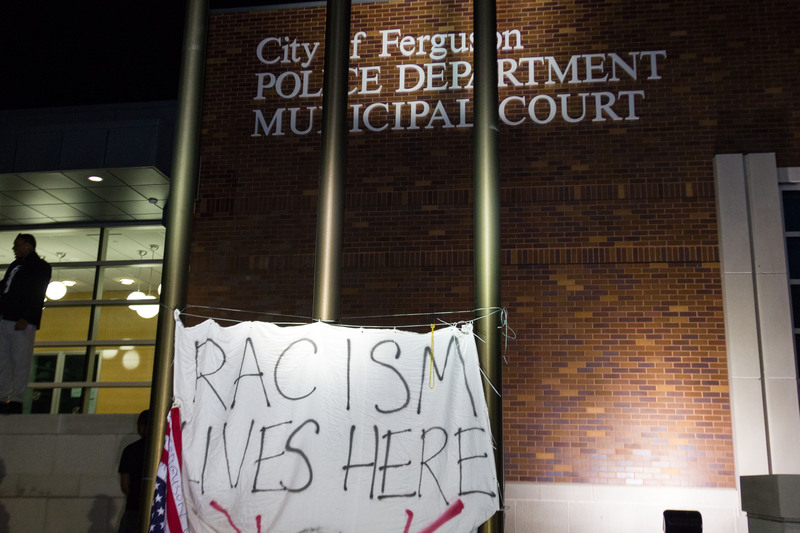 I was taking pictures at Ferguson City Hall and the police station on March 12 after Ferguson Police Chief Jackson’s resignation was announced. I stayed at the protest that followed for few hours. Protesters used chalk to write messages on the parking lot of the police station, a couple of people were arrested, there were some arguments and a fight in the crowd, but it seemed like things were winding down when I left to pick up a friend from the airport. 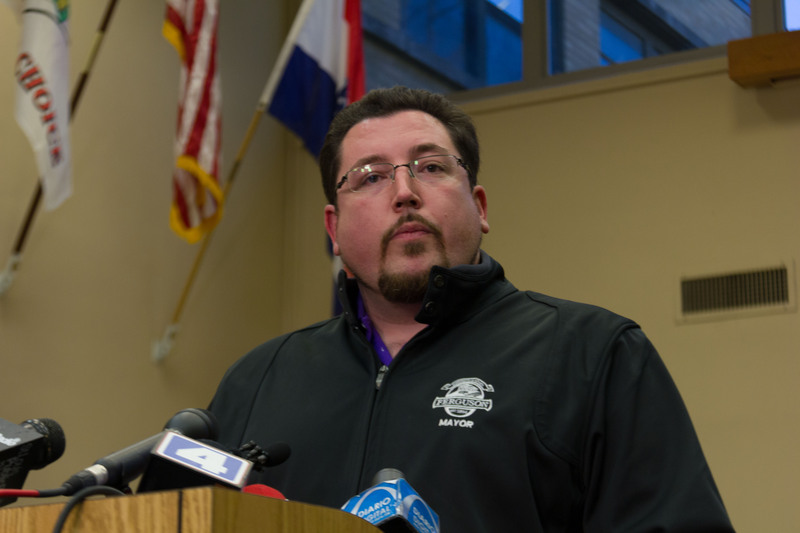 Ferguson Mayor Knowles announcing Chief Jackson’s resignation at a press conference in Ferguson City Hall. 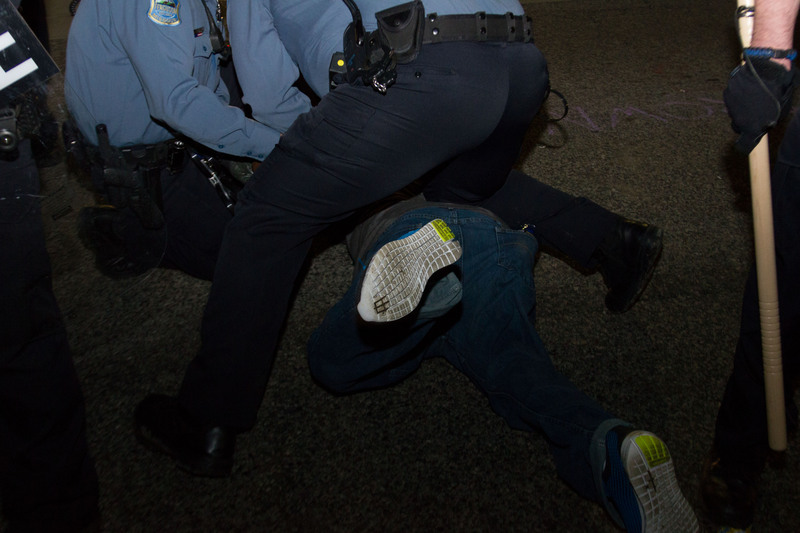 After I left the airport I checked Twitter and read that two of the police officers at the protest had been shot. This event made the subject matter of the photo show at IPHF too volatile and they decided postponed it indefinitely a few days later. 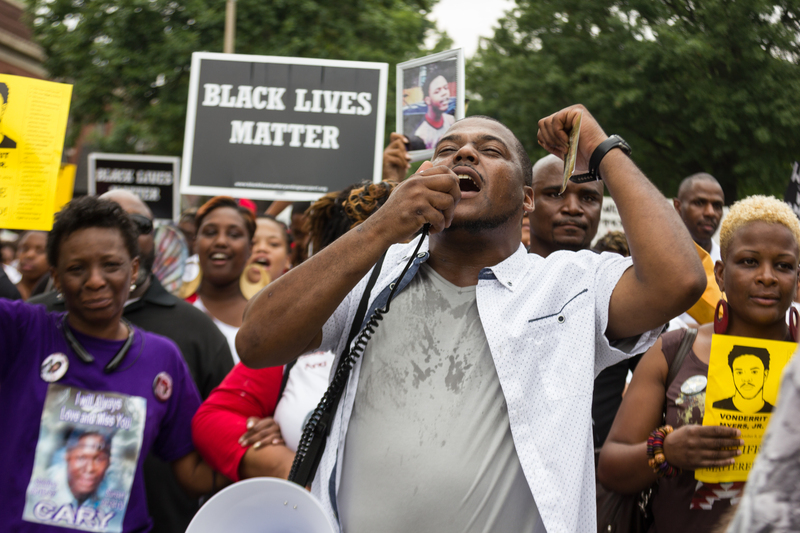 A man leads chants at the “United We Fight” march on the weekend of the one year anniversary of Michael Brown’s death. 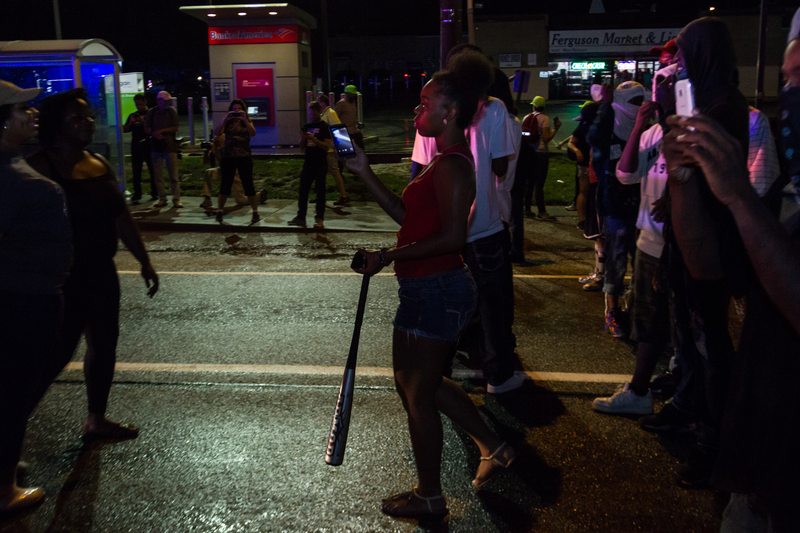 A woman walks toward riot police with a metal baseball bat on the anniversary of Michael Brown’s death. 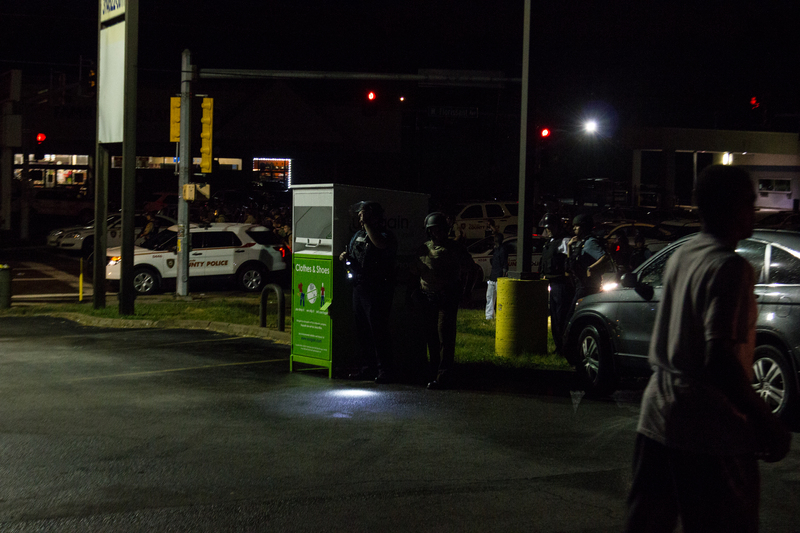 Police and protesters take cover after gunfire is exchanged on W Florissant Ave.
Fast forward to August near the one year anniversary of Michael Brown’s death, and I get contacted again about the project coming back as Chronicle :: Ferguson. After covering the events of the weekend I go into the office on August 19th for a planning meeting and my first day of contributing to the project, and again, it would not go as I had planned. As soon as the meeting starts we made a decision to leave and go to a large protest in North St. Louis city for Mansur Ball-Bey, an 18 year old killed by police that morning. A march had ended near the site of the shooting just before we arrived, and as we walked into the protest we were hit with tear gas as police used that and beanbag rounds from shotguns to disperse the protesters. Here is one of the three live broadcasts I did that night while taking pictures. 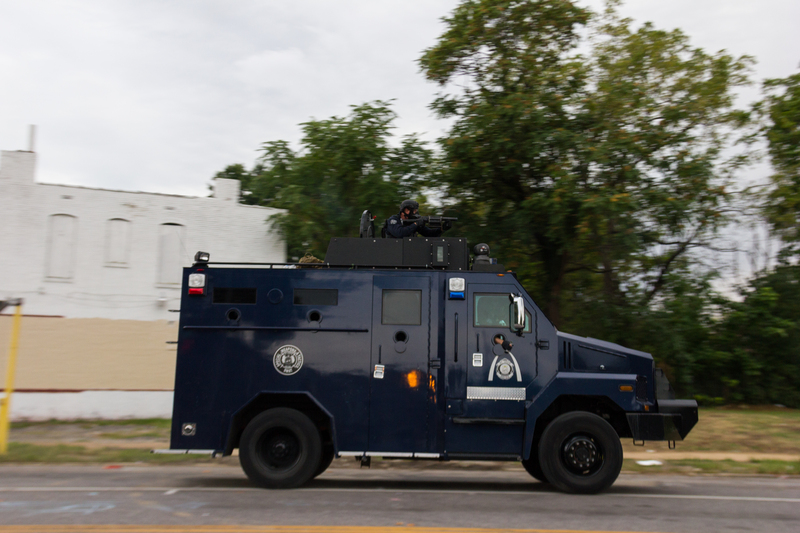 Police with grenade launchers drive down Page Blvd. 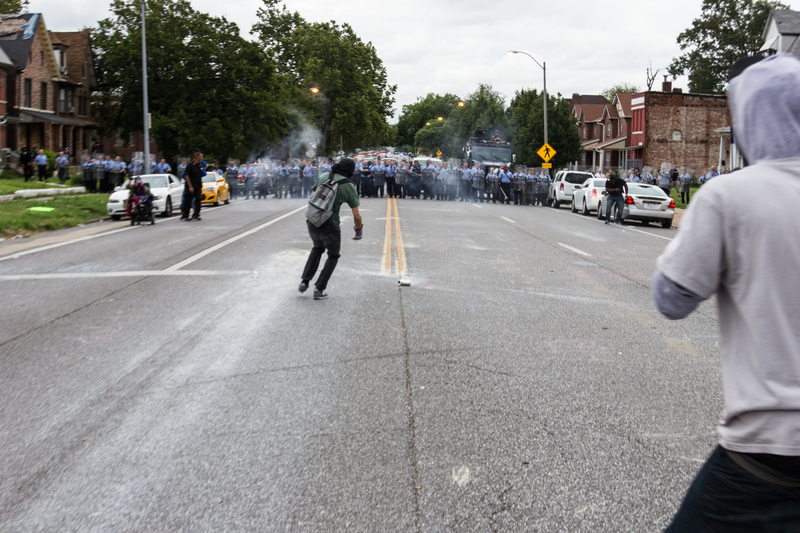 in St. louis, launching tear gas to disperse protesters from the area that Mansur Ball-Bey was killed by police. A protester runs towards tear gas to throw back at police. The protest did not die down after dark even as police pulled out of the area. We were taking pictures near the police line as the sun was going down, and had to dodge rocks as they flew past us toward the police. 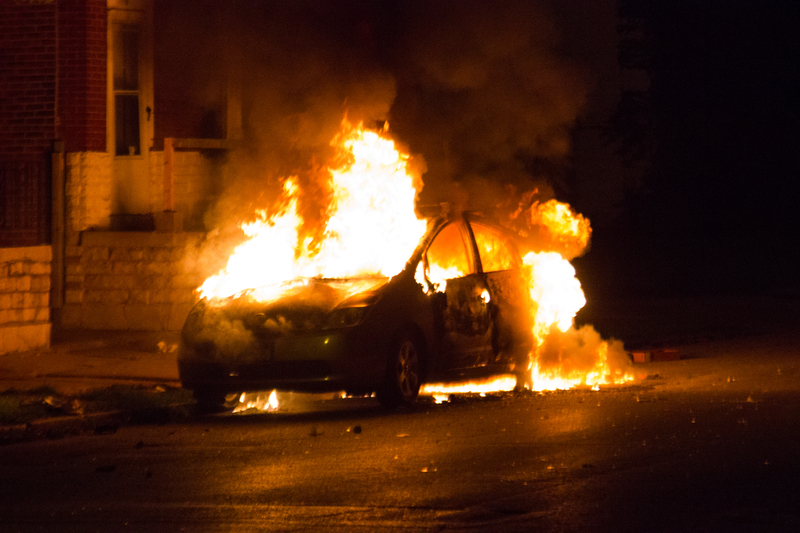 Soon after that a Prius was set on fire on a side street off Page, trash was being dragged into the street and set on fire, and two buildings were burned. 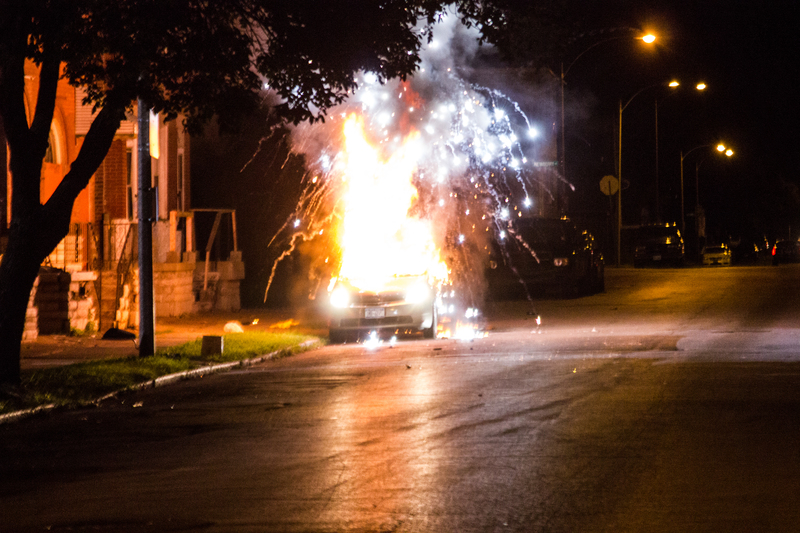 A Prius explodes after being set on fire during a protest for Mansur Ball-Bey who was killed by police earlier that day. 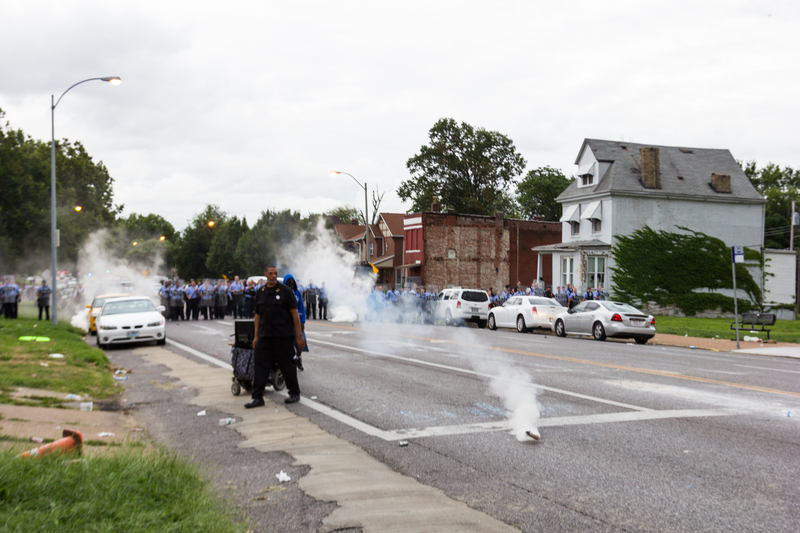 We have a few rounds of really big news coming out soon about what is happening with Chronicle :: Ferguson, so add us on Facebook, Instagram, and check out our website at Chronicleferguson.com.